Line-X Williston: Protect Your Truck With Our Line-X Services! Many drivers across the Roughrider State seek out the best truck accessories to keep their vehicle safe. After all, your truck is a major investment, and one that can provide the power needed for both work and recreation. You spend a lot of time in your vehicle, so why not protect it with the best services? Alpine Truck Accessories is proud to be your local truck shop. We stock the best off-road parts, including lift kits, tires, grilles, winches, and more to equip your machine for any challenge. Our truck parts store is now also an authorized Line-X retailer, delivering the best spray-on liners in the industry. If you’re ready to protect your truck with the best, call us for the best Line-X services in Williston and beyond! Today, we’ll discuss the unsurpassed quality of Line-X coatings. Our truck accessories team is here and ready coat nearly any surface with Line-X paint, so be sure to stop by our store for assistance! Oftentimes, the quality of your spray-on liner depends on how well it bonds with the surface of your truck’s bed. This thick polyurea elastomer is designed to bond chemically with your existing bed, conforming to every curve and contour to ensure complete protection. Minor errors can compromise the quality of your bedliner, so be sure to invest in services such as Line-X coatings for complete coverage! Here in the north, we are subjected to a wide range of weather patterns. Oftentimes, truck drivers find that the past use of their beds has resulted in dings, scratches, and gouges. These damages can pave the way for leaks, corrosion, and rust to infiltrate, eating away at the beauty and structure of your truck. Instead of fighting this constant oxidation, you can benefit from our spray-in bedliners. Harmful chemicals are commonly found in truck beds nationwide, often resulting in damages to the vehicle itself. Instead of leaving your machine to the mercy of diesel, bleach, petrol, cleaning agents, and more, keep it all out with Line-X coatings! Regular wear and tear is unavoidable; Line-X tends to disagree. With a professional spray-in bedliner, you can benefit from amazing protection day-in and day-out. 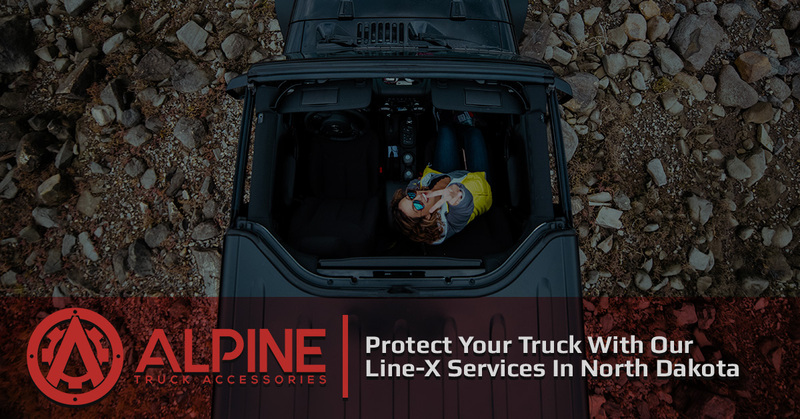 Unlike many liners, which can vary in thickness and consistency (reducing your truck’s protection from damages), Line-X is engineered to be precise. Drivers who decide to invest in this service from Alpine Truck Accessories will be amazed by the comprehensive protection, as their Line-X spray will look like a factory finish. The rigid surface of this seamless finish helps to prevent a wide range of damages, resisting dents, scratches, and more. It’s hard to argue with the long-term value of Line-X spray applications. The National Automobile Dealers Association (NADA) noted that spray-on liners typically add to the resale value of any vehicle. Regardless of the age of the truck you drive, our quality Line-X services can increase its worth, relying on unbeatable results to do the talking for us. One advantage that many drivers do not consider until driving down Hwy 2 is the acoustical benefits of Line-X. Simply put, the shock-absorbing benefits of this spray help to dampen vibration, reducing the decibels coming from your truck’s bed. Many drivers that benefit from our Line-X services in Williston notice an immediate difference, as the sounds of bumps, potholes, and gear are effectively muffled. While the rest of your vehicle may be the cause of a loud commute, your new spray-on liner will help to quiet the ride. Drivers can also benefit from our spray-on liners’ easy repairs, simple maintenance, and safe outcomes! There are so many advantages of using Line-X sprays installed by our professional team that it would be quicker for you to drive to our shop and receive the installation so that you can see for yourself. Alpine Truck Accessories is proud to be your resource for rugged, dynamic truck accessories across North Dakota. Our company is also an authorized dealer of Line-X for Williston drivers, delivering unsurpassed quality that is warrantied for life. Contact us today to learn more about the benefits of this service, or be sure to stop by our store for the best truck accessories and 4×4 parts!